This month I am working on grad school applications. Something that really stresses me out. And university website designers are very much on my bad list right now. I have about exactly a month till everything has to be sorted out and sent in. At least I figured out which schools I am applying to and contacted all my professors for letters of recommendation. In other news I am still carving that beast of a huge lino print I started a while back. I am about 70% carved on the first layer. 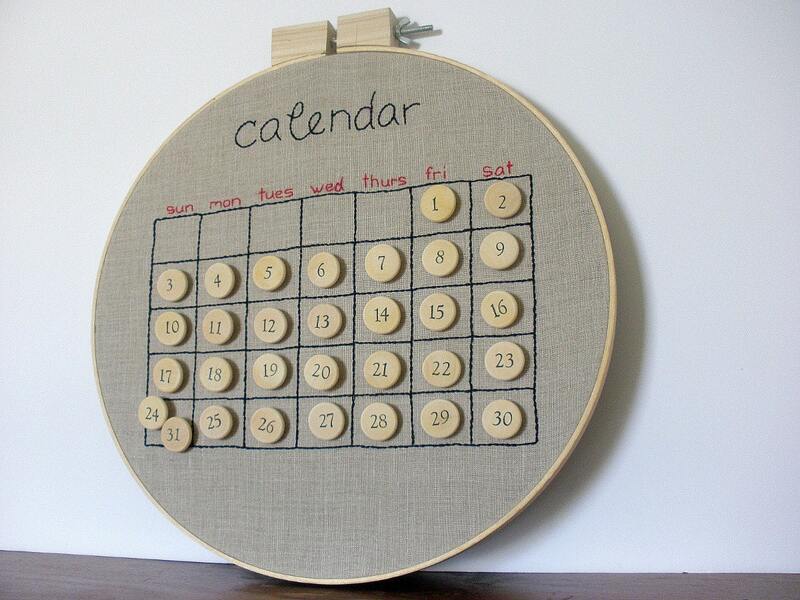 Not that I would approach the calendar problem as an embroidery project. But the movable and re-attachable numbers means that you could use this for as many years as you like. A perpetual calendar… I could print an awesome single relief print which includes the grid square, back the print with a magnetic sheet and make the numbers into little magnets. I am still working out the kinks but because it isn’t year specific it wont matter if everything sells the first year. This was written by Hannah. Posted on Tuesday, December 14, 2010, at 3:26 AM. Filed under Life. Bookmark the permalink. Follow comments here with the RSS feed. Post a comment or leave a trackback. That sounds like a great idea, Hannah! I look forward to seeing what you come up with!